The Reacher is the handy helper that reaches so you don&apos;t have to. The Reacher is the handy helper that reaches so you don&apos;t have to. 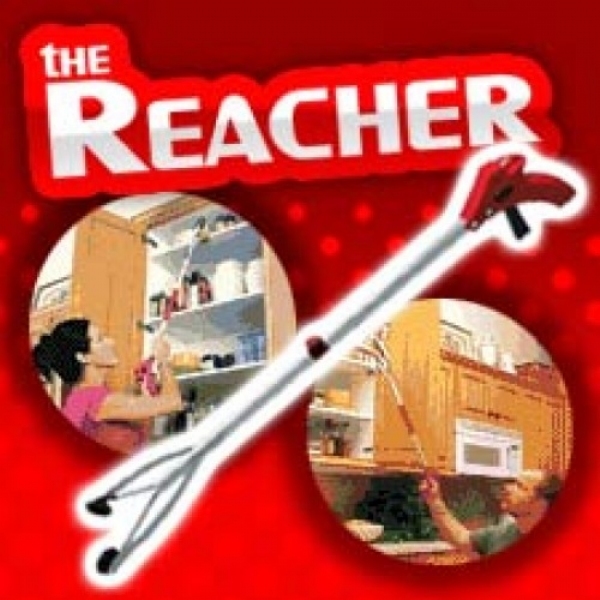 Use The Reacher for reaching up high, or for picking up down low. In the laundry room The Reacher is the best, it&apos;ll get that odd sock in the impossible to reach area. Grip and lift in one easy motion. The Reacher secret is the suction action combined with the easy locking handle that gives you the power to reach, without stretching or bending. The Reacher pick up and reach tool is safer than a chair. It takes the bending and reaching out of your daily chores. The Reacher is precise enough to pick up a paper clip. This is so helpful to reach things that are out of reach. Also, if you drop something down behind furniture, etc. It&apos;s a terrific tool. Need to reach up high and also down low and sometimes in between. I use this product every day in my kitchen to reach things in the refrigerator, cabinets, and pantry. I also use it to pick up items I drop on the floor. It is so easy to use and helps me to be more independent. My husband likes it because I do not have to call on him to pick up or reach things for me! It is not for picking up heavy items, of course, but lighter items work very well! We have a low lying roof that builds up with ice we use this tool to lay salt disk on that roof. It works. I use it outside to pick up sticks and trash, because i have a bad back. aally want to touch a lot of that nasty trash. I also have used it to pick up dead birds,etc. I also love to pick up walnuts and toss them out of the way of my mowing areas. Also use it to pick up falling fruit. Uses are endless. The only con is can&apos;t find this product as easily as before. I have several of these in different places. In Kitchen and living room. In the barn. and on my golf car. There great. Although the bending part is some time breakable but it still works. Actually here to get another one. I use it to reach things because im in a wheelchair.. I can have an extra arm..